I was intrigued, the closet thing I ever come to Swedish culture is the plate of Swedish meatballs at IKEA. Or the Swedish Chef on the muppets. Unfortunately I only just saw this sign today and when I looked it up online I found out it’s something that sells out quickly. The menu includes items like hard boiled eggs with mayo and shrimp, smoked salmon, the meatballs, red beet salad, and other entrees that include herring. They called it “assorted herring” and I have no idea what that means. Maybe pickled and smoked? I don’t know that I’ve ever had herring. They are supposed to have live music too, I grew up in New Mexico so I’ve heard music at the pow wows and mariachi music, Mexican polka music and other forms of music. I’ve heard bagpipes in person, but I have never heard any kind of traditional Swedish music, although, does ABBA count? Had I known about this special dinner a couple of weeks ago I would have signed us up, maybe next year. 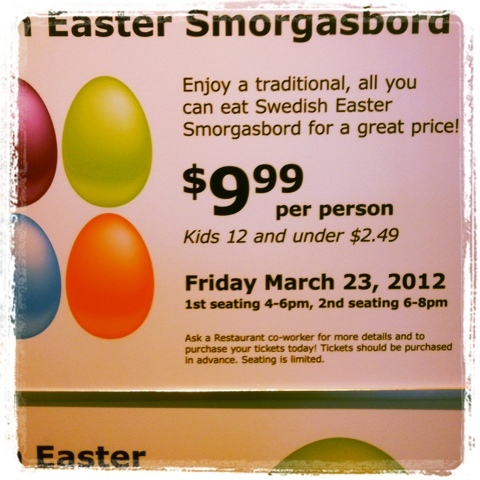 This entry was posted in Instagram, Project 366 and tagged Easter, herring, Ikea, Instagram, project 366, salmon, smorgasbord, Swedish. Bookmark the permalink. My father was an orphan, so I don’t know much about my national lineages, but I was born blond in Wisconsin, home to a large percentage of Swedes, so I can guess. And I do know much Swedish food is delicious. (Probably stay away from the lutefisk). They make a pastry thing, fry-bread with powdered sugar that is to die for.